Check for drafts – Now is the time to ensure your home is sealed up tight to prevent cold drafts and excess heating. A good starting point isto look for old caulking or weather stripping that needs to be replaced. For more information, click here for a great article on detecting air leaks. If you do happen to notice a problem with the caulk in your home, it is an easy, do-it-yourself project. Please see here for simple steps to follow the next time you need to reseal. Mulching leaves – While most people tend to rake and bag their leaves, you may consider the alternative of mulching them instead. 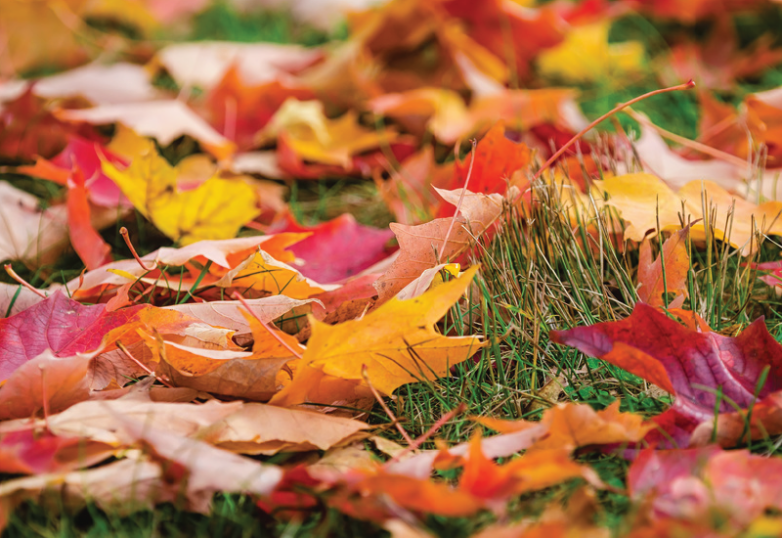 Mulching leaves has many benefits including the improving grass and reducing weeds. For more information read here, or do some further research to make the best decision for you. Test your home’s detectors – Smoke and Carbon Monoxide detectors are one of the most valuable assets to your home, and ensuring they are working properly should be one of your top priorities. It is recommended that you test your smoke and carbon monoxide detectors once a month and replace their batteries twice a year. A good rule to follow is to change the batteries when you change your clocks. Evaluate your roofing – Before we get hit with snowfall, it is a great idea to give your roof another once over to ensure there are no cracked, broken or missing shingles. Without intact shingles, you run the risk of your home getting water damage as the snow melts. Read here for more information, but remember, roofing work is dangerous and it is always a good idea to hire a professional. Keep gutters clear – Due to the high amount of autumn debris from leaves and twigs, it is imperative to ensure that your gutters and downspouts are clean. Clearing your gutters allows for water to drain properly while also preventing them from getting weighed down, causing separation from your home. With the wide variety of issues that can come from clogged gutters, it is best to clean them in early fall instead of waiting. Check your HVAC system ahead of time – Have a certified professional perform a standard maintenance check on your heating and air conditioning system now before the cold sets in. During this time, it would also be beneficial to replace your air filter according the manual’s instructions. This way, you can be sure that there will be no down time when you really need it most. **If your air conditioning unit is outdoors, it is advisable to put a cover over it while not in use. Adjust HVAC dampers – With the weather cooling down and many people starting to run the heating in their homes, it is important to remember to make these changes. By adjusting the damper in your home, you can redirect the warm air to the lowest level of your home. Since heat rises, this adjustment will help with the amount of energy your furnace uses to heat your home. Turn on humidifiers – Another change that occurs in fall is the level of humidity in the air. Along with the cooling temperatures the air becomes dryer. Using a humidifier to increase moisture in your home has many positive impacts such as reducing dry skin, lessening static electricity and helping your home feel warmer. Please refer to your owner’s manual for instructions specific to your unit. Chimney inspection – After sitting dormant during the warm months, a good practice is to contact an NFI Certified Chimney Sweep to evaluate your chimney and fireplace for cleanliness. Having a dirty chimney can result in fire or carbon monoxide poisoning. Click here for a great resource to help you when determining your selection. Winterize outdoor faucets – Before freezing temperatures arrive, it is necessary to winterize any outdoor faucets. To do so properly, you must drain all water from the faucet before shutting off the outdoor water supply. When water freezes, it can build up pressure, resulting in pipe bursts and possible leaks which cause major damage to your home. This website offers a great tutorial on winterizing your faucet as well as other basic maintence operations. In addition to draining faucets, it is also a good idea to drain and store any hoses which may be attached to outdoor faucets. It is recommended they be rolled neatly and stored in a dry place. If your home has an irrigation system, it is advisable that these be drained as well. In some cases, the homeowner may be responsible for this on their own and should consult their owner’s manual or hire a professional for assistance. In other circumstances, homeowners may have an HOA that does the work for them when appropriate. Click here for more winter plumbing tips. Reverse ceiling fans – During the cooler months of the year, it is ideal to switch the rotation of your ceiling fan blades. By doing so, the fans help to push warmer air towards the floor as it rises. Be sure to review your owner’s manual for recommended maintenance for your specific unit or call a professional for servicing. Check walkways and driveways – Take the opportunity now to evaluate your walkway and driveway for cracks. This would be the perfect time to get them filled preventing water from settling in and freezing, causing them to get bigger and more expensive to repair later. Reorganize shed or garage – Rearrange your garage or shed so fall and winter tools are more accessible and shift other things back that you won’t need. This is also a great time to clean and store seasonal furniture. By preparing now, you can get ahead of the game and have a much smoother winter.